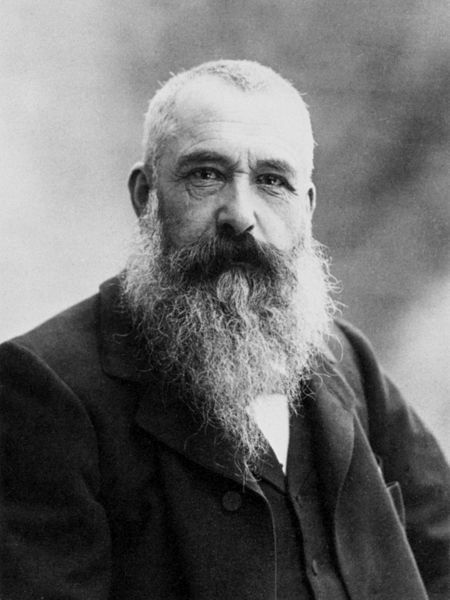 Monet’s name is synonymous with Impressionism and he was one of the founders of French impressionist painting. Claude Monet was born on November 14th, 1840 and died December 5th, 1926. He was the most consistent and prolific practitioner of the movement’s philosophy of expressing one’s perceptions before nature, especially as applied to plein-air landscape painting. 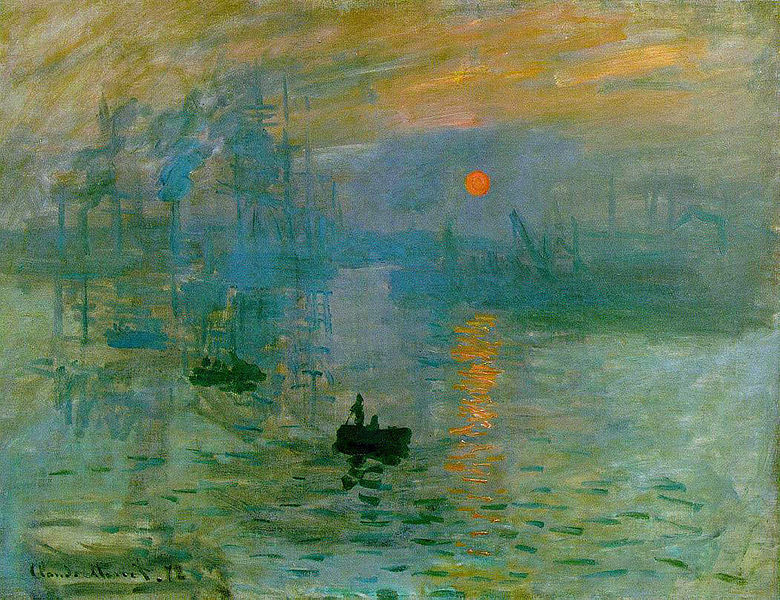 The term Impressionism is derived from the title of his painting Impression, Sunrise (Impression, soleil levant). In 1845, his family moved to Le Havre in Normandy. His father wanted him to go into the family grocery business, but Monet wanted to become an artist. His mother was a singer. In April 1851, Monet entered Le Havre secondary school of the arts. He was very good drawing charcoal caricatures and the locals knew him well for this, which he would sell to them for ten to twenty francs. That was not cheap in those days. Monet also undertook his first drawing lessons from Jacques-François Ochard. On the beaches of Normandy sometime about 1856 or 1857 he met fellow artist Eugène Boudin. Boudin became his mentor and taught him how to use oil paints. 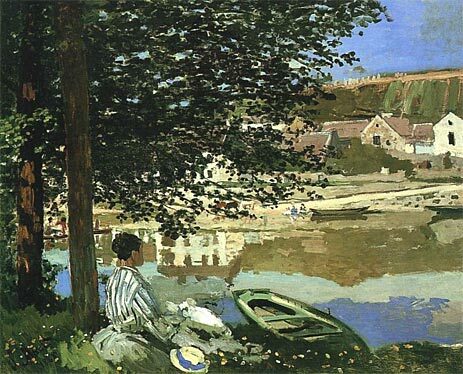 Boudin also taught Monet “en plein air” (outdoor) techniques for painting. His mother died in January 1857. He then, at the age of sixteen, left school and went to live with his aunt, Marie-Jeanne Lecadre. Monet traveled to Paris to visit the Louvre, a famous museum where he witnessed painters copying from the old masters. He decided not to follow their lead but would go and sit by a window and paint what he saw. Fortunately he had brought his paints and other tools with him. Monet stayed in Paris for several years. During that time he met other young painters who would become friends and fellow impressionists. Among them was Édouard Manet. In mid 1861 Monet joined the First Regiment of African Light Cavalry in Algeria for a seven-year commitment, but after two years he had contracted typhoid fever. His aunt intervened to get him out of the army if he agreed to complete an art course at an art school. On the Bank of the Seine, Bennecourt 1868, an early example of plein-air impressionism. Disillusioned with the traditional art as taught at art schools, about a year later in 1862 Monet became a student of Charles Gleyre in Paris, where he met Pierre-Auguste Renoir, Frédéric Bazille and Alfred Sisley. Together they shared new approaches to art, painting the effects of light en plein air with broken color and rapid brushstrokes. That technique later came to be known as Impressionism. Monet’s Camille or The Woman in the Green Dress (La femme à la robe verte), painted in 1866, brought him recognition and was one of many works featuring his future wife, Camille Doncieux; she was the model for the figures in Women in the Garden of the following year, as well as for On the Bank of the Seine, Bennecourt, 1868, pictured here. Camille became pregnant and gave birth to their first child, Jean in 1867. Monet took refuge in England in September 1870 after the outbreak of the Franco-Prussian War. There he studied the works of John Constable and Joseph Mallord William Turner, both of those artists landscapes would serve to inspire Monet’s innovations in the study of color. It must have been shock and disappointment when in the spring of 1871 Monet’s works were refused authorization for inclusion in the Royal Academy exhibition. In the spring of 1871, Monet left London to live in Zaandam, in the Netherlands. There he painted twenty-five paintings. In October or November 1871, he returned back to France. Monet lived from December 1871 to 1878 at Argenteuil, a village on the right bank of the Seine River near Paris. It was a popular Sunday-outing destination for many Parisians. There he painted some of his best known works of art. Then about three years later, in 1874, he briefly returned to Holland. In 1872, Monet painted Impression, Sunrise (Impression, soleil levant). It depicted a Le Havre port landscape. It hung in the first Impressionist exhibition in 1874 and is now displayed in the Musée Marmottan Monet in Paris. From the painting’s title, art critic Louis Leroy coined the term “Impressionism”, which he intended as disparagement, however the Impressionists appropriated the term for themselves. Monet and Camille Doncieux had married just before the war in June 1870. After their excursion to London and Zaandam, they had moved to Argenteuil in December 1871. It was during that time that Monet painted various works of modern life. His wife Camille became ill in 1876. 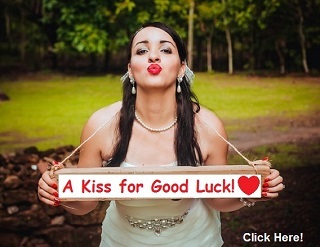 They had a second son, Michel, in March 1878, (Their first child, Jean, was born in 1867). This second child unfortunately affected her already fading health. Monet then moved to the village of Vétheuil. In September of 1879, Camille Monet died of tuberculosis. She was only thirty-two years old. Monet painted her on her death bed. A grief-stricken Monet had a difficult few months after his wife’s death, but resolved never to be mired in poverty again. He began in earnest to create some of his best paintings of the 19th century. During the early 1880s, Monet painted several groups of landscapes and seascapes in what he considered to be campaigns to document the French countryside. His extensive campaigns evolved into his series’ paintings. In early 1883, looking out the window of the little train between Vernon and Gasny, Monet discovered Giverny. Alice Hoschedé, her and his children then moved to Vernon, then to a house in Giverny in Normandy, where he planted a large garden and where he painted for much of the rest of his life. Following the death of her estranged husband, Alice Hoschedé married Claude Monet in 1892. In his own gardens in Giverny, with its water lilies, pond, and bridge, it offered a perfect place to paint. Monet was fond of painting controlled nature so his own property served him well in that respect. He also painted up and down the banks of the Seine, producing paintings such as Break-up of the ice on the Seine. He wrote daily instructions to his gardener, precise designs and layouts for plantings, and invoices for his floral purchases and his collection of botany books. As Monet’s wealth grew, his garden evolved. He remained its architect, even after he hired seven gardeners. Between 1883 and 1908, Monet traveled to the Mediterranean, where he painted landmarks, landscapes, and seascapes, such as Bordighera. He painted an important series of paintings in Venice, Italy. In London he painted two important series—views of Parliament and views of Charing Cross Bridge. His second wife, Alice, died in 1911 and his oldest son Jean, who had married Alice’s daughter Blanche, died in 1914. After Alice died, Blanche looked after and cared for Monet. 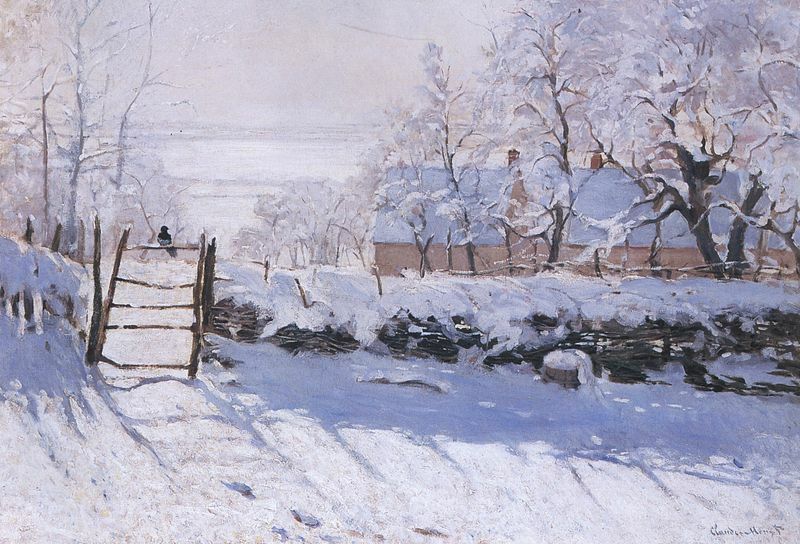 It was during this time that Monet began to develop the first signs of cataracts. Monet died of lung cancer on December 5, 1926 at the age of 86. He is buried in the Giverny church cemetery. His home, garden and waterlily pond were bequeathed by his son Michel, his only heir, to the French Academy of Fine Arts in 1966. Through the Fondation Claude Monet, the house and gardens were opened for visits in 1980. In addition to souvenirs of Monet and other objects of his life, the house contains his collection of Japanese woodcut prints.